Live performance Four proposals to feel-think (2016). Curated by Jessica Berlanga-Taylor | Fundación Alumnos47. Noé Martínez (born 1986 in Michoacán, MX). Through his art Martinez elaborates a temporal journey based on his own personal experience and the immediate context, creating historical and critical routes by mapping the consequences of political, social and historical processes in daily life and registering local realities in different media, focusing particularly on memory as a space of ideological inscription. Using reconstruction as an aesthetic operation, his work is a record of a case study that emerges from his personal history and assumes the position as a critic of social phenomena. Topics such as language, the history of European invasion during the sixteenth century, the ethnic reprocessing and acceptance of Mexico's indigenous people in political processes today, and the political potential of memory, encircle the reflections of this artist who questions the development and interpretation of the common past. By means of ethnographic compilation, field research and the study of archives, Noé Martinez generates artistic proposals that reconstruct affective and ideological circumstances from the phenomenology of the image and the art object. He collaborates with María Sosa (born 1985 in Morelia, Michoacán, MX), whose work is based on research into pre-Columbian history. She emphasizes the moment of contact between the native peoples of America and the Europeans, and the way in which this historic moment shaped the structural column of contemporary reality. The artist borrows methodologies of anthropological and historical research to set up her own methodology of artistic research, employing observation as her primary tool and combining archaeological study and historical sources with material work. She conceives history as a sculptural material whose modelling capacity permits direct intervention in the present. María Sosa maps the phenomenon of conquest by focusing discussion on its social and cultural consequences. Consequences, moreover, that affect the context of contemporary art. At the VENICE INTERNATIONAL PERFORMANCE ART WEEK 2016, Martinez and Sosa show the live performance presented by Fundación Alumnos47, Four proposals to feel-think. The performance focuses on the human body and four orientations or themes that the artists have identified as historically, politically and spiritually vital, both to the history of Mexico and the moment of impact or collision between its indigenous cultures and the Spanish, and the consequences of this in our present day. Human rights, slavery and exploitation in Mexico, loss of language and identity, ritual, memory and substance are some of the issues the two young artists touch upon. 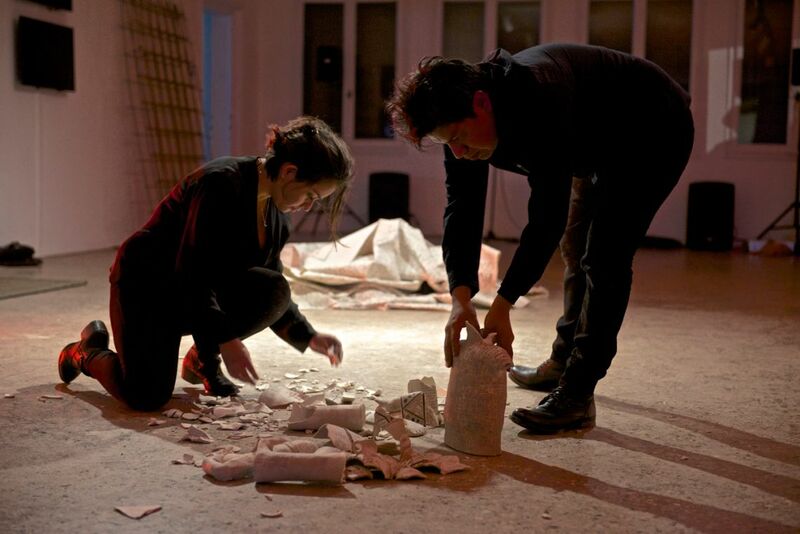 The objects, used to create diverse read outs, moving sculptures, plays with words and translation, body gestures and movements reminiscent of ancient clay and pottery pieces are being produced in Mexico City in their studio (cloth, a clay piece and a print on paper). Fiercely poetic, María Sosa and Noé Martinez's work tells the other side of many stories, and highlights the misunderstandings created by colonialism.